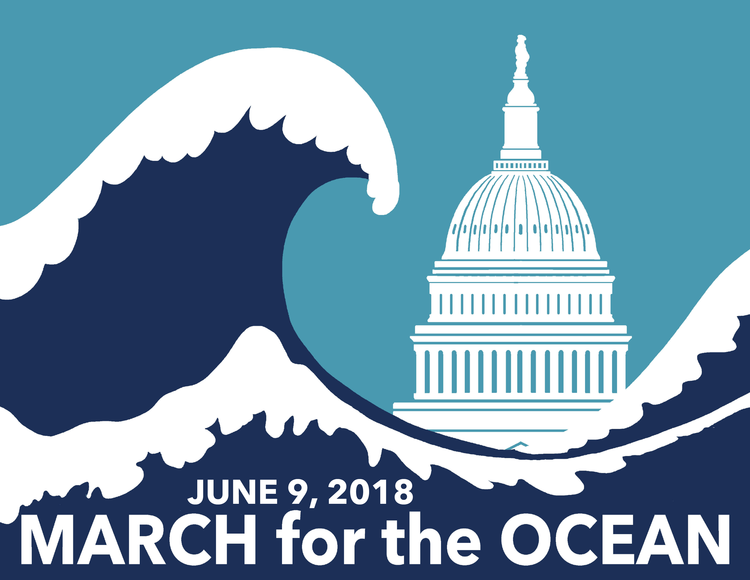 On Saturday, June 9, 2018, join the March for the Ocean in Washington D.C. or a sister march across the country. We will march to fight offshore oil drilling, end plastic pollution and protect our coastlines! Every system has a tipping point and the ocean is no exception. Covering 71% of our planet, it's the foundation of life on earth and essential to our future survival. Yet, our generation is bearing witness to a rapid decline of ocean health, spurred by climate change, plastic pollution, energy development, overfishing, and other threats. That's why people who love and depend on the ocean are assembling in Washington D.C. on June 9th to #MarchForTheOcean (or will wear blue if they can't be there in person). As a movement of environmentalists, beachgoers, surfers, students, fishermen, social justice advocates, businesses and others we must unify our voice to raise awareness of these problems and demand government and industry leaders take action to address them! Organized by Blue Frontier, the March (MFO) is supported by over 100 partner organizations including Surfrider Foundation, Sierra Club, Earth Day Network, Greenpeace, Oceana, Ocean Conservancy, Plastic Pollution Coalition, the National Aquarium, Monterey Bay Aquarium, Pacific Coast Federation of Fishermen’s Associations and many more (for the full list of march partners go to www.marchforocean.com). The M4O program will include the march, speakers, live music, interactive exhibits, and a flotilla of boats and kayaks on the Potomac River. Key platform priorities include: stopping reckless offshore oil drilling proposed by the Trump administration; reducing the flood of plastic waste that is killing ocean wildlife, and preserving coastlines in the face of rising seas and extreme storm events. For all of us who get so much from our ocean, coasts, lakes, and rivers - this is an opportunity to unite our voice and give something back. The event follows Capitol Hill Ocean Week on June 5-7 2018 in Washington, DC, which brings marine policy leaders from around the world to discuss important issues that affect our oceans and Great Lakes. Join over 700 scholars, scientists, businesses and conservation leaders — all focused on ensuring that our stunning ocean and wildlife will be stunning generations to come with their beauty. Registration is now open for the free conference and Capitol Hill Day, convened annually by the National Marine Sanctuary Foundation. The Surfrider Foundation is looking forward to a strong presence at the March for the Ocean, with chapter members, staff and supporters traveling to our nation's capitol for the event. Surfrider's D.C. Chapter will also host a fundraising event that all visiting attendees are invited to attend. Finally, those who can't make it to Washinton D.C. are encouraged to 'Wear Blue for the Ocean' on June 9th and so there support in local communities and on social media. The March for the Ocean is about the survival of our blue planet. But it’s also about the fact that it’s not too late to turn the tide and restore and protect what we love.